Description Heated Leather Seats, Nav System, Entertainment System, Third Row Seat, Moonroof, SAFETY & CONVENIENCE PACKAGE, 10" REAR SEAT ENTERTAINMENT PACKAGE, Hitch. Limited trim, SILVER SKY METALLIC exterior and GRAPHITE interior. READ MORE! 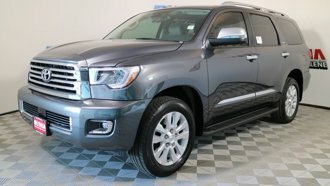 Leather Seats, Third Row Seat, Sunroof, 4x4, Power Liftgate, Rear Air, Heated Driver Seat, Back-Up Camera, Running Boards, Trailer Hitch, Aluminum Wheels, Dual Zone A/C, Cross-Traffic Alert, Blind Spot Monitor, Brake Actuated Limited Slip Differential Rear Spoiler, Keyless Entry, Remote Trunk Release, Privacy Glass, Child Safety Locks. SAFETY & CONVENIENCE PACKAGE outside mirror memory, Radio: Premium Display Audio w/Nav/Entune/JBL, amplifier, AM/FM CD Player w/MP3/WMA playback capability, touch-screen display, auxiliary jack, USB 2.0 port w/increased charging capability and iPod connectivity and control, hands-free phone capability, phone book access and music streaming via Bluetooth wireless technology, and voice recognition (integrated backup camera vehicle dependent), The Entune App Suite includes Bing, iHeartRadio, MovieTickets.com, OpenTable, Pandora, Yelp and Facebook Places (on CY13 audio only); real-time info including traffic, weather, fuel prices, sports and stocks, Two-Position Power Memory Driver's Seat, 10" REAR SEAT ENTERTAINMENT PACKAGE. At Lithia Toyota we are focused on providing customers with an honest and simpler buying and service experience. You can review vehicle comparisons online, research features, read expert reviews, get a quick quote, compare prices, schedule a test drive, value your trade-in and find incentives and offers. Our hand selected pre-owned inventory has passed our AssuredService 160+ point inspection BEFORE they are listed online for sale. Plus TT&L, fees and $150 dealer doc fee. Price contains all applicable dealer incentives and non-limited factory rebates. You may qualify for additional rebates; see dealer for details. The image may not represent the actual vehicle. Price varies according to trim levels and options. See dealer for in-stock inventory and actual sale price. All prices plus taxes, title and license with approved credit. MSRP includes delivery, processing and handling costs. Dealer doc fee $150.00 not included in the price. Prices may be different outside of each advertised period and do not necessarily reflect the price at any other time.